Rebecca Gethin and Valerie Morton are writers, both from the UK. They are also friends of mine. I am proud of them. They made something exciting happen – an anthology called A Poetry of Elephants, which is raising money to support The David Sheldrick Wildlife Trust. 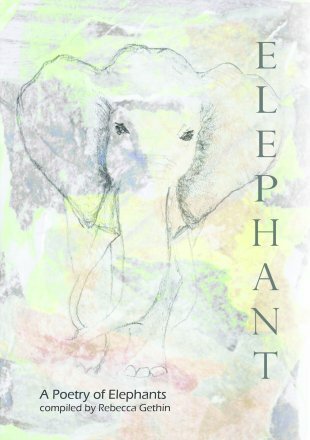 A Poetry of Elephants – front cover. Click image to enlarge. Here’s more about A Poetry of Elephants. At the link you can find a list of all the participating poets, read a selection of poems from the anthology AND you can order a copy (or copies) AND/OR contact the publisher for more information. 1. How and why did the elephant project get started? In January last year I was in Sri Lanka and that was where I fell in love with elephants. I met some in a sanctuary for elephants who had retired from work or whose owners could no longer afford to keep them, as well as seeing several elephants in Ude Walawa National Park. I defy anyone to meet a real elephant and not fall in love. On my return, I got in touch with the Born Free Foundation to ask if I could become a poet-in-residence in the park but they said I would have to apply to the Sri Lankan government department. They never replied. When I came home I read as many books as possible…. Katy Payne’s Silent Thunder, Lyall Watson’s Elephantoms, Lawrence Anthony’s The Elephant Whisperer. Being a bit of a writer, I tried to write some poems about elephants. (Copyright The David Sheldrick Wildlife Trust) Click on image to enlarge. 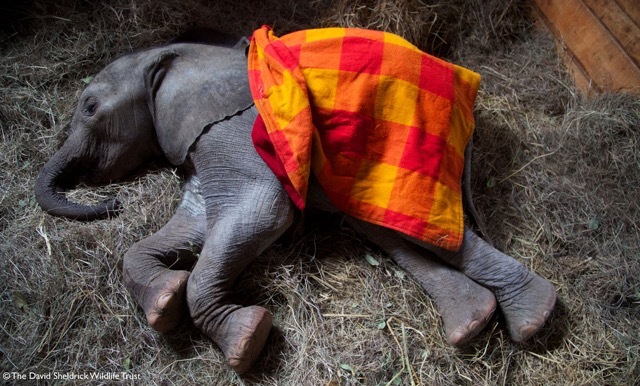 David Sheldrick Wildlife Trust and I read all about their work rescuing baby elephants. I suppose the idea of a poetry anthology really started when I went to an inspiring talk given by Saba Douglas-Hamilton, (daughter of the conservationist Iain Douglas-Hamilton) about her project, Save the Elephants. She was touring the UK to spread the word. At the end she said something like ‘when you go home, you must all think about what you can do to help save elephants’ and that made me think of creating an anthology of poems about elephants. The next day, I gingerly put out a call for submissions on Facebook and within 2-3 weeks about 28 poets had sent me poems. I created an e-book of the poems and for a while it was read and noticed but then as with all things on-line it seemed to be forgotten until…. Valerie sent me a message about turning it into a print version. 2. How and why did you get involved, Valerie? From the moment Rebecca put the anthology together I felt a little seed inside growing and knew here was something special we could do together. It was such a good idea that somehow I couldn’t bear the thought of it living such a short life as things seem to do online, and then flying off into the ether. It so deserved to be there in print and working to help those elephants she felt so passionate about. For me also it was a wonderful opportunity for poetry to act as a voice for these beautiful animals. I have loved them all my life and have been horrified at the cruel trade in ivory which threatens their survival. When I lived in India I campaigned for the better treatment of elephants used for tourism purposes, and yet, like everything is in India I also saw the most incredible bond between some working elephants and their mahouts. They lived, slept, bathed, and worked together. I have been lucky enough to be in a position to fund the publication of the printed version of A Poetry of Elephants and so I put the question to Rebecca and she said yes …….. and so it began. 3. 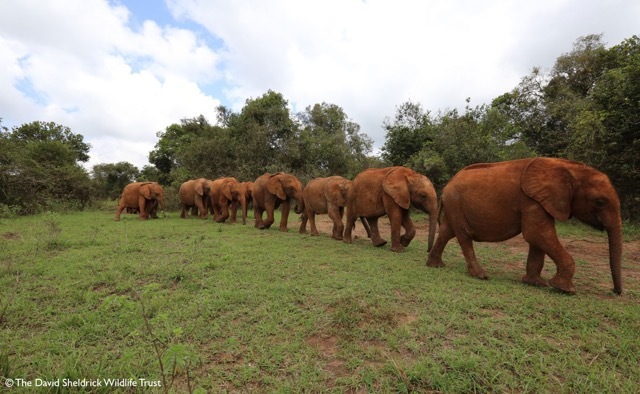 All money raised from sales of the anthology goes to The David Sheldrick Wildlife Trust. What makes this organization special? Murit (Copyright The David Sheldrick Wildlife Trust) Click on image to enlarge. 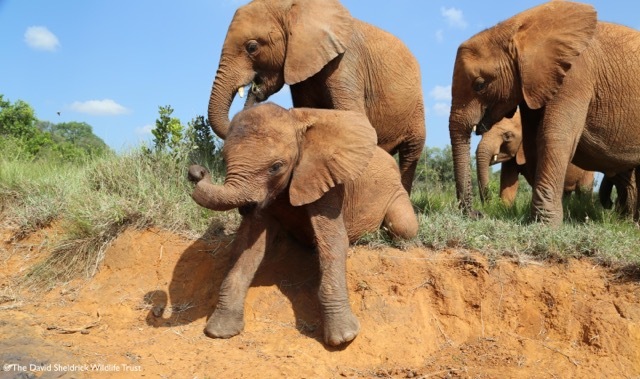 Although there are many wildlife organisations featuring the plight of elephants, The David Sheldrick Wildlife Trust has special appeal because it operates within Kenya itself and focusses on protecting the habitats in which elephants and other species live. They successfully rescue and nurture orphaned elephants and rhinos with the aim of rehabilitating them back into their natural environment. This offers hope for the future of these beautiful animals who are so threatened by widespread poaching for ivory and horn, and the clash between human requirements for land. The Trust runs successful programmes aiming to improve living conditions and educational standards amongst local communities which help to encourage future generations to protect their wildlife and environment. It also gave us a special opportunity to celebrate their 40th anniversary in 2017 …… the story behind the dedication and passion of this one family is very inspiring and it seems very appropriate that our poetry collection should be able to be a voice and to be a part of these celebrations. 4. What’s been the response to the project so far? And what are your hopes and plans going forward? Some of the poets have been great at publicising the book and encouraging kind people who have bought multiple copies for friends for presents at Christmas. Quite a few of the poets feel a great sense of loyalty to the book which is heart-warming, so much so that several poets are travelling to Teignmouth Poetry Festival (on the south coast of SW England so not exactly central!) to read their poem(s) in a special session about the elephant anthology. This will be on Sun, March 19th at 2pm. I’m hoping this might be repeated in or two places later in the year perhaps..maybe organised by other ‘elephant poets’. I’d also like to add that Galatea Resurrects recommended this anthology in a list of recommended reads for 2016. 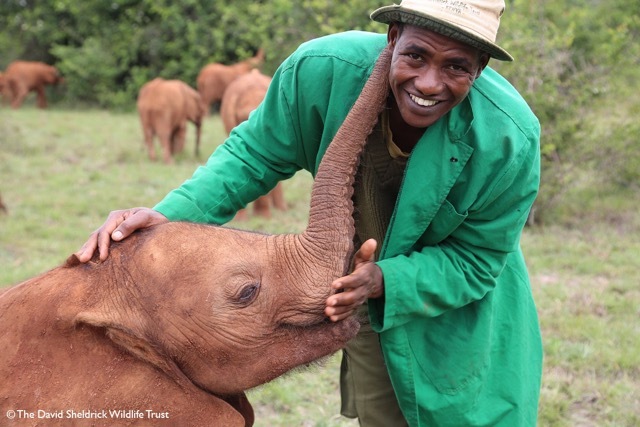 Dupotto (Copyright The David Sheldrick Wildlife Trust) Click on image to enlarge. Apart from the overwhelming support of the contributing poets themselves, I have been very impressed at the orders received during the first two months from many diverse and unexpected sources. In all we were able to send a first tranche of funds to the charity amounting to £900 (which included three very generous donations amounting to £200) and this is a tremendous achievement. It seems there is a lot of support out there for wildlife and elephants in particular and so far there has only been time to tap into a part of it. The time leading up to Christmas kept us busy distributing orders and it is now hoped that during 2017 we can find many new avenues to explore. The poetry festivals will be wonderful so there is all that to look forward to. We go into 2017 with optimism and hoping to build on the successes we have already had. The enthusiasm has been quite infectious. I am grateful to all who have supported us – it has been more than I could possibly have hoped for. And there is more to come. Many thanks to Elly from Earth for helping to spread the word with this interview. 5. It seems to me that collaborative work like this project can tell stories, tell them in new ways, and be a way for individual writers to “get involved” with big issues and connect with others. It feels hopeful. Do you have advice for other writers who might consider doing a project collectively for a cause? My advice is to go for it. If people have written poems on a subject you feel strongly about then they feel as passionate as you, by definition. Poets, in my experience, are naturally great at collaborating and love that their poems are in good company. This little book took off because of its collaborative nature…Valerie, Karen, Elly and the printer as well as all 31 poets. I worked hard to keep all the poets on side by keeping them informed and double checking everything. I myself found all the different voices in this book very inspirational and that is moving and ultimately very rewarding. Thank you very much to one and all. For me this project gave me back a faith in poetry in the sense of its connection with the wider world, and the way it can be a voice for so many issues facing us today. The extent of the support is a testament to this and, fanciful though it may seem, it felt as though the elephants were listening. 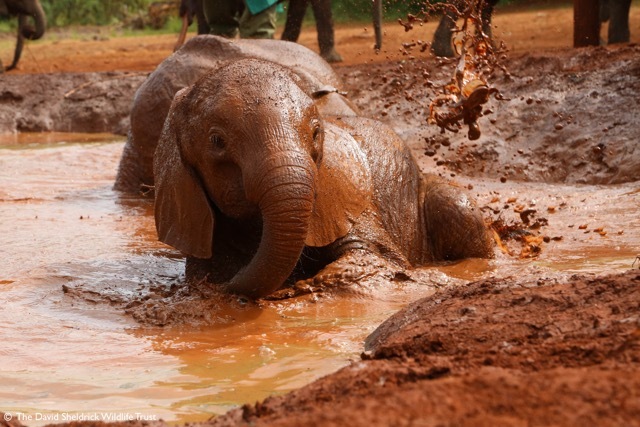 Rapa (Copyright The David Sheldrick Wildlife Trust) Click on image to enlarge. It also gave me personally an opportunity to learn publishing skills and inevitably to discover the unexpected ……… from deciding on the cover design, to acquiring an ISBN number, agreeing the cost, registering the title, through to liaising with the printers. I was very grateful for the patience of everyone concerned over the few months it took from start to finish, especially Karen Dennison who typeset the document to printer-ready standard without once complaining about the number of amendments she was requested to make, and my husband who acted as postman as the orders came flooding in. Inside these pages is the work of wonderful poets who make this a book one to treasure. I am grateful to Rebecca Gethin for allowing me to put this into print – the response has far exceeded my expectations. It has been incredibly rewarding. I wouldn’t hesitate to do this again – just give me a cause and I’m ready to go. My thanks to everybody involved. Thanks so much, Rebecca and Valerie! 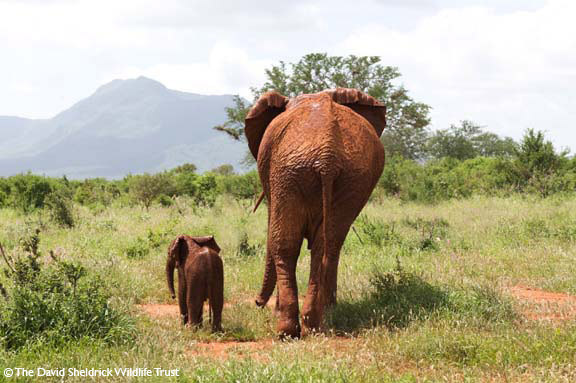 Emily with Eve, the beginnings of her very own family (Copyright The David Sheldrick Wildlife Trust) Click on image to enlarge. Thank you Elly for this marvellous piece of investigative journalism. Brilliant. All power to baby elephants this year. This is a wonderful cause, I hope you sell lots of copies at the festival. Thanks for the opportunity to work with you Elly and to watch this interview emerge into this wonderfully eye-catching presentation. It takes us into 2017 helping to raise more awareness as to what is happening to our wildlife and environments that will disappear if we don’t do something. That is not the legacy I would like to leave to future generations. I am now getting a second print run – so onwards and upwards with our poetic voices towards helping to preserve all wildlife that is threatened by us – we won’t know what we have lost until it is gone. And what better way to celebrate the 70th birthday anniversary of The David Sheldrick Wildlife Trust. Thank you.